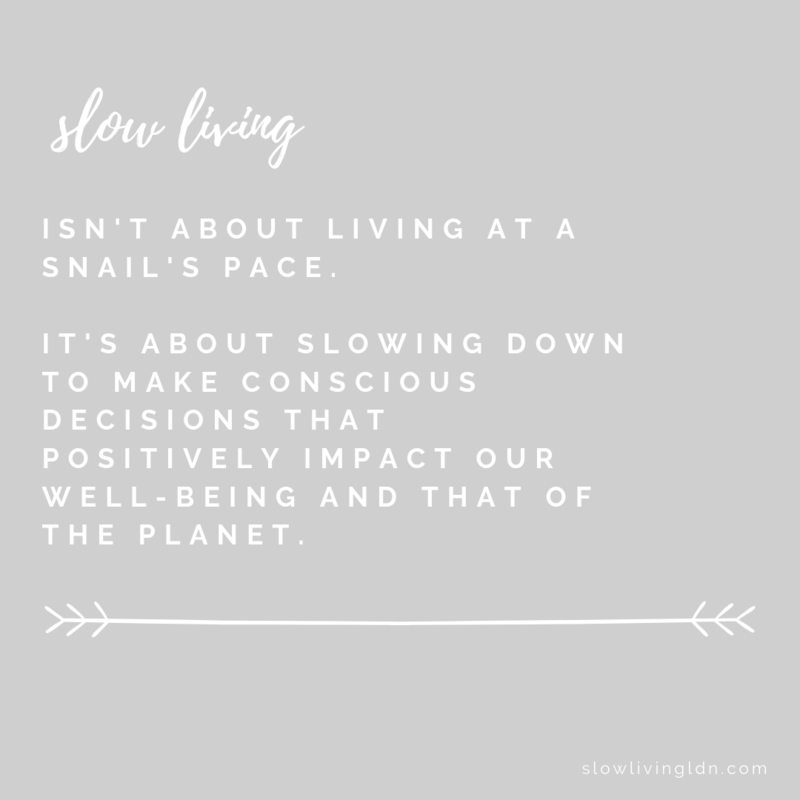 What is Slow Living? | Slow Living LDN. Slow living is more than a rural-inspired aesthetic that fits into perfect Instagram squares; it’s a way of living that acknowledges today’s fast past of life. It denies that burnout equates to success and that doing as many things as possible as quickly as possible is always the optimum for your own well-being and for the planet’s. There is no one way to practise slow living – different people may embrace slower moments in different areas of their lives. And, despite the aforementioned beautiful aesthetics on social media, it isn’t just reserved for those who live in the countryside. Discover our interpretation of slow living in the modern era. Technology has accelerated our pace of living. It brings many benefits, but with most things in life, when over-consumed, its effects can be less positive. With 24/7 digital connection, the boundaries between work hours and non-work hours are increasingly blurred, creating for some, an inability to switch off or be present in the current moment. Earlier in 2018, the Mental Health Foundation commissioned one of the largest known studies of stress in the UK. For participants that recorded high levels of stress, 12% acknowledged that the feeling of needing to respond to messages instantly was a stress factor. According to Ofcom’s The Communications Market 2018 report, 88% of adults that ‘ever’ use the internet spend an average of 24 hours a week online. That’s almost double the average time spent in 2007 – coincidentally the year the first iPhone was launched. In addition, 19% of adults claim to spend more than 40 hours a week online, that’s up from 5% in 2007. As our screen time increases, what other activities are losing out to scrolling and swiping? Slow living embraces living in the moment and assigning it more meaning, rather than always capturing it first for social media. It encourages us to switch off from digital distractions by taking breaks from our devices to feel present and re-discover our creativity and focus. Technology has accelerated our lives and forever changed consumer culture. While we’re often very grateful in times of need to be able to live conveniently and take advantage of ‘express’ options such as ‘next day delivery’, we’ve become arguably impatient. This is also exacerbated by our smartphones and their app features which have been likened to slot machines, creating rewards by a simple ‘swipe down to refresh’. The addictive ‘rewards’ being another marketing email we’ll probably never read, likes from ‘friends’ or a new post on Facebook from someone we don’t really know. When we live at an accelerated pace, we can miss the everyday beauty around us. Slow living is about slowing down to pause, reflect and enjoy small details that we often take for granted or miss entirely. Instead of always focusing on the end product and how we can achieve it as quickly as possible, for some, slow living is also about enjoying the process taken to create something. Rather than buying pre-prepared food, slow living can be as simple as enjoying the process of cooking or growing food from scratch. It’s an understanding that good things take time to be made and merit time to be enjoyed. A key part of our definition of slow living is around redefining what it means to be successful. London is one of the most stressed regions of the UK and we feel that there is a perception that busyness equates to being successful. Have you ever felt guilty about leaving work on time and wonder what ‘hard-working’ colleagues will think of you for heading home, even though you know you’ve done what’s needed that day? Slow living doesn’t have to mean giving up the rat race in favour of living in a barn conversion in Cornwall. Although that can often be our finishing line! It’s about learning how to work smarter. If we take inspiration from principles, such as a Sweden’s lagom, we can put more emphasis on working efficiently, rather than working longer. We leave more time for slow moments to recharge, or moments filled with our favourite hobbies and good friends. The thread that can be seen to pull slow living together is not a perfect minimalist aesthetic and a 100% luddite lifestyle, it’s the act of making conscious choices. It’s slowing down the rhythm of everyday life enough to notice when we’re on autopilot, accepting a poor work:life integration, and endlessly scrolling on our phones. Slow living means making conscious choices to improve our well-being or quality of life in a certain moment. This can be a temporary moment or a recurring moment – something that we’ve build into a ritual or habit. It can also mean slowing down to understand how our choices affect not just ourselves, but the planet and those around us. For example, instead of accepting a plastic bag or non-recyclable coffee cup because of a lack of time, with a little organisation and by building some positive habits you can succeed in bringing your own. We don’t believe that living slowly means always living at a snail’s pace. Rather, it means taking the time to make conscious decisions that positively impact our well-being and that of the planet. That’s instead of always feeling ‘too busy’ to make change. It means slowing down to do things at the right speed for you and celebrating today, rather than always anticipating tomorrow. Ultimately, slow living is accepting that we can’t always do everything. So, what if we did less, but did those things better? 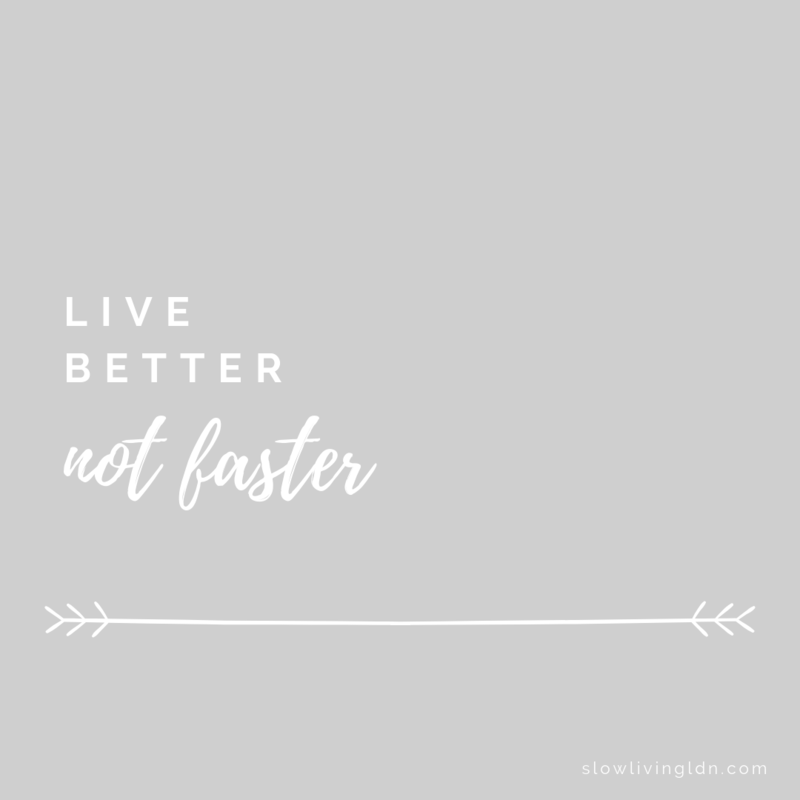 Let’s live better, not faster.